Various attempts have been made in the past to estimate the global ocean thermal energy potential with also a significant span in ranges. 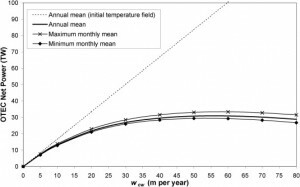 The last IPCC reports states a recoverable OTEC potential of 108-324 EJ per year while the IIASA ended up with a value of 30,000 EJ per year [Avery, W. H., and G. L. Dugger. “Contribution of ocean thermal energy conversion to world energy needs.” International Journal of Ambient Energy 1.3 (1980): 177-190.]. 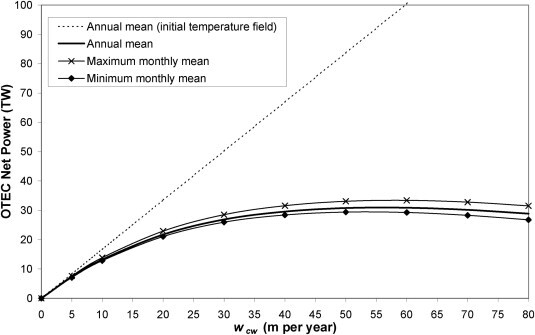 Better understanding of the thermal processes and effects that OTEC operations has on ocean temperatures and vice versa is important to predict energy yield potential on both local (site-specific) and global scales. This is especially true since a 1°C variation in seawater temperature can lead to a 15% energy yield difference in output. In an earlier study the One-dimensional (1-D) water column models have been used extensively to determine the limit of OTEC resources [Nihous, G.C., Ocean Engineering, 34, 2210-21, 2007], estimated to be around 3-5 TW (resource is self-limited by large flow rates required and temperature differences). However, 1-D models do not account for mechanisms of horizontal transport phenomena, which can greatly change OTEC potential and plant operation performance. 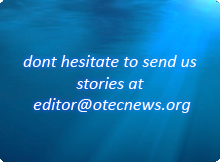 Recently the use of Ocean General Circulation Models (OGCM’s) has been proposed as an alternative to traditional 1-D modeling for evaluation of the OTEC resource. OGCM’s are capable of describing a wide range of globalized atmospheric, oceanic and climate phenomena by the use of state-of –the-art fluid mechanics simulations. OTEC operation is simulated in the OGCM by mass flow variations (singularities) that represent water intake and outtake at the different operation depths. The small thermal energy extractions that occur in the OTEC plant are neglected so temperature and salinity characteristics in the effluent are determined from simple mixing models. With the modified temperature field that account for the presence of OTEC in the OGCM the power density can be determined using simple equations. Results from the same project also found that using this 3D model OTEC net power is maximal using an OTEC equivalent deep seawater vertical velocity of 60 m/year; however, operation under this condition may cause considerable changes in both surface and deep water ocean temperature. OTEC power would grow with this velocity indefinitely if plant operation didn´t interfere with preset ocean temperatures; in reality this is not the case as the figure below shows (wcw stands for equivalent deep seawater vertical velocity). Use of this type of modeling allows for better understanding of the effects of OTEC deployment in global phenomena (changes in water temperature and its effect on atmosphere-ocean interaction or global warming, to name some). Moreover, 3-D models account also for important differences in global OTEC potential estimations. As modeling of ocean temperatures and it’s interaction with OTEC operations is refined, interest in this sustainable energy technology will keep on rising until it will hopefully be able to find a market of its own. How much ocean thermal energy can be converted to electricity?